Designed for use with Solo 330 dispenser. 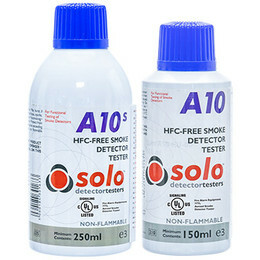 How Many Detector Tests Would You Expect To Complete With A Single Solo A10 250ml Can? Environmental conditions: both ambient temperature and ambient air speed can have an effect on how much of the aerosol is used during a test. User: How long the nozzle of the aerosol is held down for. Instructions tell the user to carry out 1-2 second burst and repeat every 5 seconds as necessary. Equipment: Panel and wiring delays and time to alarm are also a factor. Polling from the panel can delay the time to alarm and effect how much aerosol is used. Another factor is how the aerosol canister has been stored. 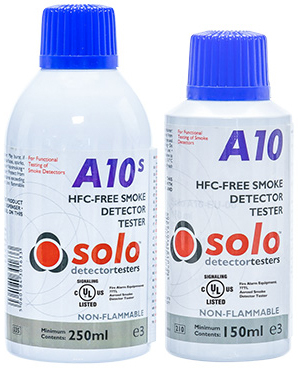 if during storage (at either the reseller or the customer premises) any aerosol canisters are exposed to high temperatures, this will affect the maximum number of tests achieved from a single aerosol canister.